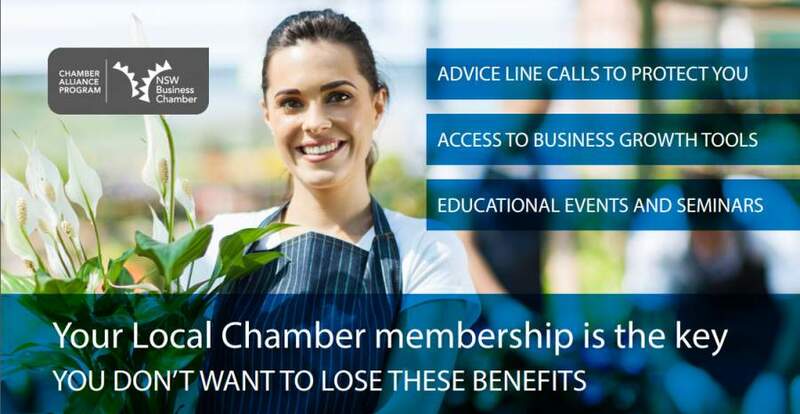 Don’t let your membership benefits lax – renew your Local Chamber membership to continue receiving the proactive business support you need from the state’s peak business community – NSW Business Chamber, with over 20,000 members! Being part of your local chamber, a not-for-profit business support organisation made up of leaders and business owners, the Chamber Movement provides value for members through advocacy, representation, information, education, promotion and networking. interpreting an award or manage a redundancy? Get peace of mind with just one call! Our advice line team are experts in Industrial Relations, Legal and Marketing fields. Business Propel Included A blank business plan template is a daunting task. Step by step, question by question you’re guided through the core of what you need to develop to focus on growing your business. Education Events Local Chamber Member rates Focused on compliance and business development, NSW Business Chamber events will help your business stay up-to-date and meet your legal requirements. Business Magazine and e-Newsletter Included Quarterly electronic Business Connect Magazine, coupled with monthly newsletters keep you up-to-date with the latest business news and trends across NSW and Australia. Business Hotline: 13 26 96 Included Just one call and you are connected to the right information, support and advice. Business Solutions Information and/or discounts Access and/or information on: Apprentices and trainees, Export Documentation, HR Compliance and Documentation. Recruitment Solutions, WHS and more!